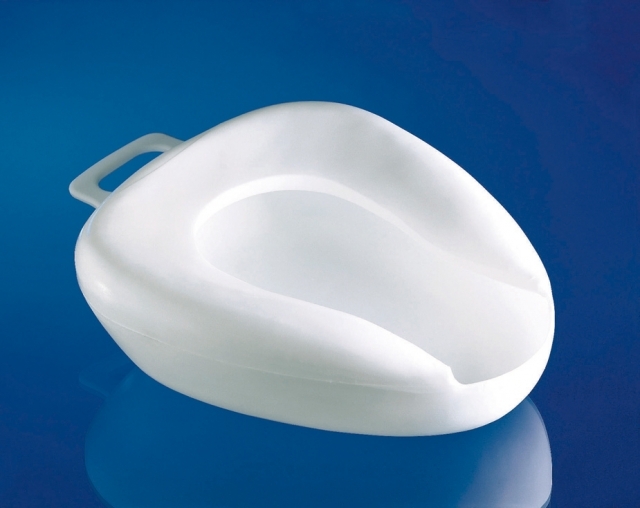 Polypropylene bedpan with handle for ease of use. Autoclave or sterilising solution cleaning. Integral handle for storage or carrying. Overall Height: 990mm (39"). Overall Width: 640mm (25¼"). Overall Depth: 880mm (34½"). Width Between Arms: 470mm (18½"). Seat Height (aperture): 527mm (20¾"). Seat Height (Padded): 547mm (21½"). Clearance (square bowl/ disposable pan rack): 470mm (18½"). Seat Depth: 465mm (18¼"). Castor Diameter: 125mm (5").